This morning I went back to the white Lotus I was trying to draw for 2 days and started again. That’s it in the center here. It closed up a little since yesterday, except one petal is drooping. It’s cloudy today,but it was sunny yesterday. I watched Marco Polo on Netflix and saw a lot of Lotuses and Lotus imagery. It didn’t look like the one I was drawing. Then today, a lady from India stopped to talk to me. She told me where the Lotuses from her country are. They’re not on the path, so I overlooked them. They’re pink on the edges, very delicate pink lines going into white with the lower petals a little greenish. She told me the petals are perfect architecture. I agreed and thanked her for the info. This is the Lotus people know and love. She told me they don’t last long, but there are a lot of buds. The giant leaves look the same. The 2 flowers on the outside here are the pink Lotuses. 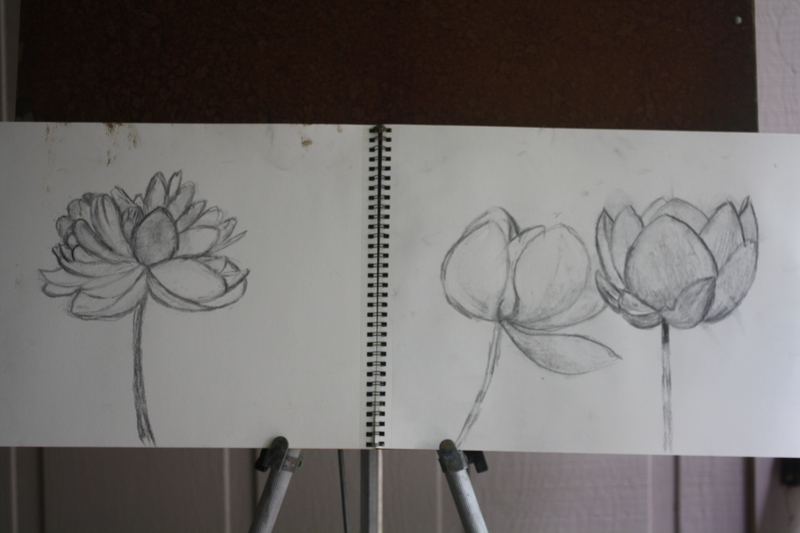 The one on the left is all the way open and the one on the right is closer to traditional Lotuses that you see in art. I still need more practice drawing Lotuses before I paint one. 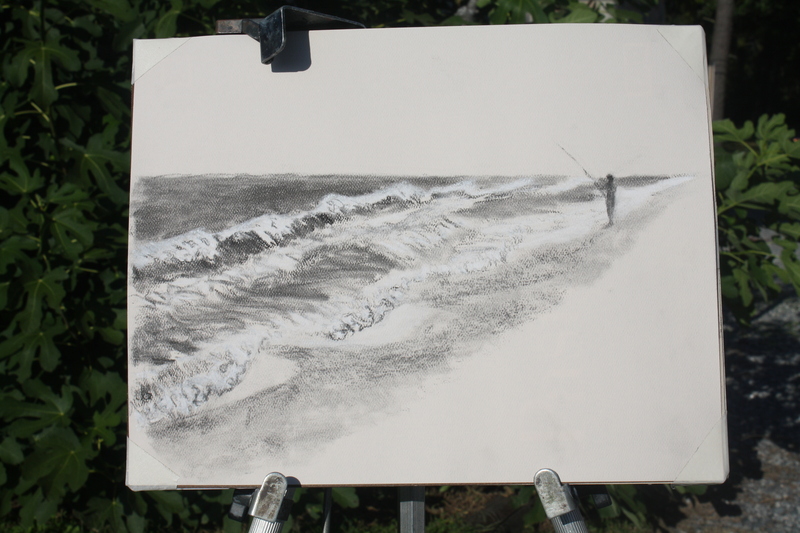 One nice thing about drawing in plein air is that people tell me things about the subject. 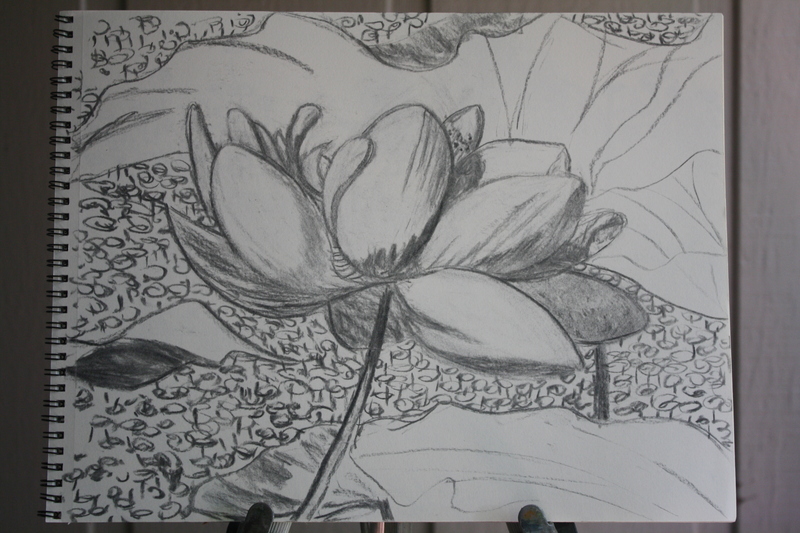 It was much easier to draw the Lotus this morning than it was yesterday afternoon because I was standing in the shade! Now I know I have to do this painting in the morning. A lady told me she heard they only bloom for one day. I guess they change so fast, one day they’re opening, the next day they’re in full bloom, and if I go back tomorrow the petals might be drooping. You should see how the leaves blow around in the wind. They’re moving models! They wave like flags, even folding in half and unfolding again and again. In the short time I was there doing this sketch the flower moved a lot too. I can use this sketch for my painting but I’ll make some changes. The weather is ungood for drawing in plein air outside, so I’ve been planning a still life. 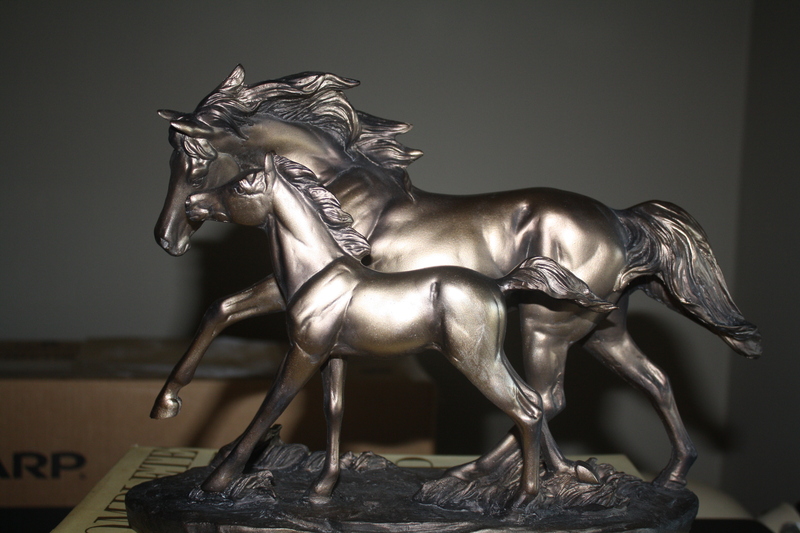 I’ve always loved horses and looked for nice models. Finally I found these at Cracker Barrel for $40. It took me a few hours to get this far, which is fast for me! I’ll work on it more tomorrow. I drew them life size because it’s easier than drawing small. For my still life I’ll scale them down by making a grid. This is what they told us at York Academy of Art: It’s ok to make a grid to scale up or down a drawing if it’s your own drawing. 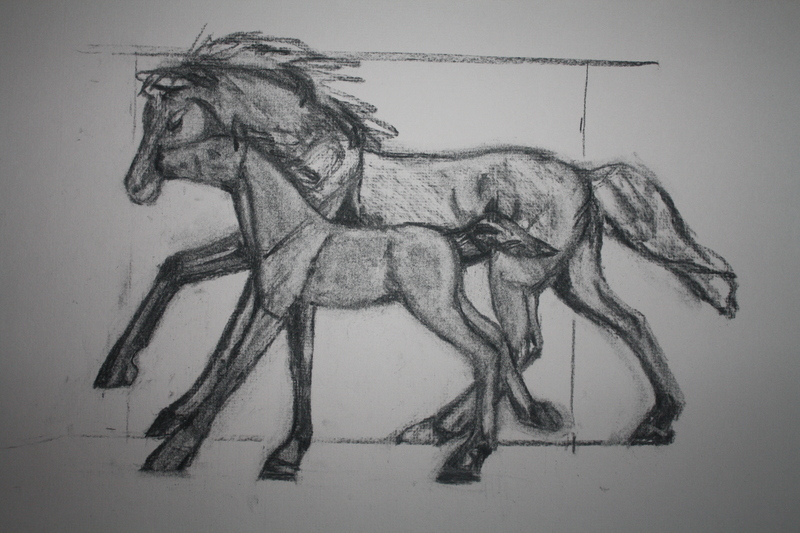 Taking the time to try to match the proportions of the horse strengthened it in my mind. There is a file in my head for horses. If I took a photo and traced it for my drawing, that file would not grow. The act of drawing it freehand burns it into your mind with volume and proportion in a way that tracing a photo can’t do. The mind is basically lazy, and if it can save time and effort by relying on a photo it will, but then drawing skill doesn’t improve. Drawing isn’t something you’re born with. If you are born with some dexterity, you can work with your hands on any number of different types of art. Like playing a musical instrument, drawing takes hours of practice. 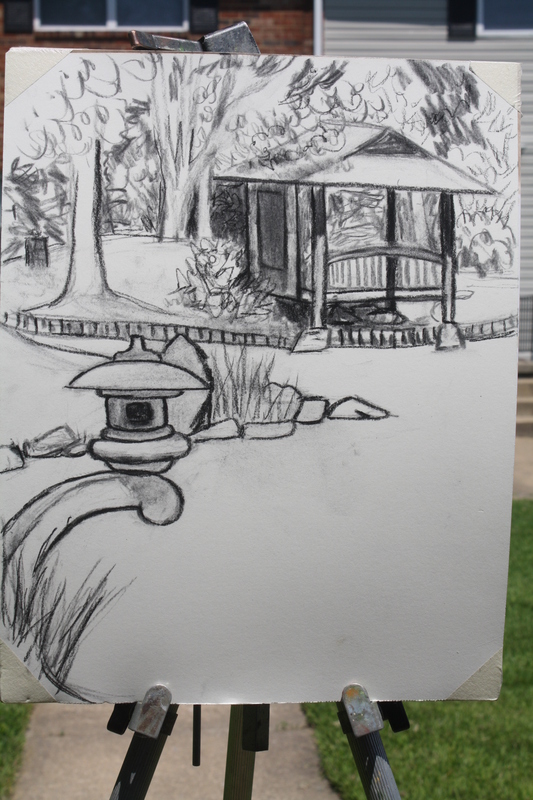 This is my 2nd try sketching the pagoda and pond. I love the Japanese garden at Maymont and wanted to paint there for a few years. The thing that stopped me is the long hill to climb in and out of there. I guess the exercise won’t hurt me. I’m going to get a workout lugging my gear. When I was down there drawing today, I met a few other artists drawing. It wasn’t a class, they are friends out casually drawing. One lady told me, “They tell you to draw without erasing.” That sounds funny to me because I erase all the time. They looked like VCU students., so I thought, maybe their teacher doesn’t know how to draw. 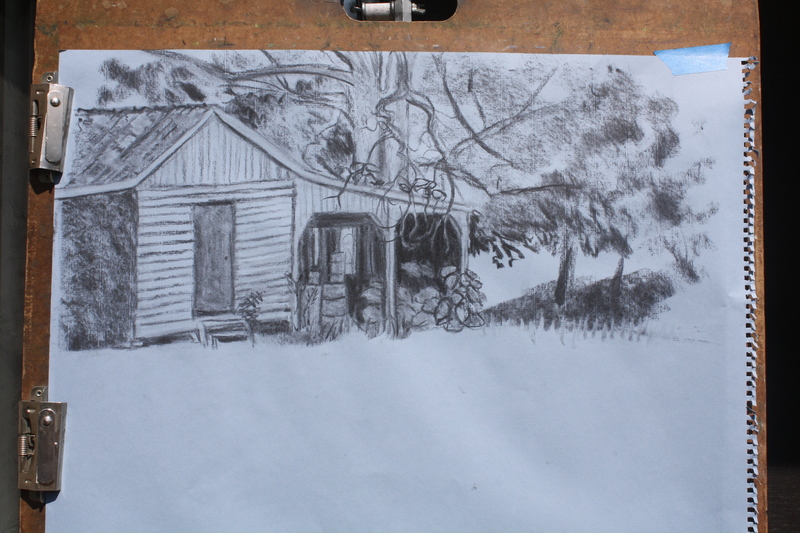 hahahhahahah Drawing without erasing wasn’t on our list of drawing exercises from York Academy of Art. YAA was a school that pushed the students to try to draw and paint in the classical tradition. They don’t follow that path in art school these days. Wait a minute. Is that a pagoda or a gazebo? I want to learn to draw the ocean. 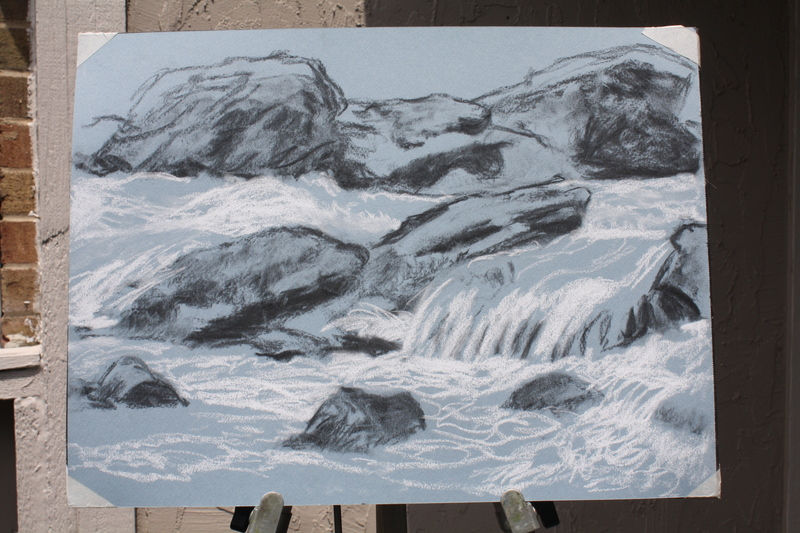 Water is always a challenge because it moves and changes color with the sky, but I don’t want to trace a photo. I sit there on the beach and stare at the waves and try to draw them. I’m trying to memorize wave anatomy. That’s my excuse. Some guys stand around on the beach for hours surf fishing. They’re not just staring at waves, they’re fishing. Hanging around on the beach staring at waves every day for no reason isn’t always socially acceptable. Unless you’re on vacation, people might call you a beach bum. The calming view of nature makes it a zen thing. In our rush rush modern world the zen effect isn’t appreciated much. We’re expected to be productive every day. With some things the long term benefits aren’t immediately noticed by the world. But if I can practice drawing and painting waves without using a camera my art skill will be much improved. So far I did about 6 studies of breakers and I did a color rough in oil of breakers too. The more I practice on this, the better I’ll be able to represent waves. Some thoughts about being in the right place at the right time. The flip side of that coin is knowing when to get the hell out of Dodge because you don’t want to be in the wrong place at the wrong time. My tip for avoiding disaster is to watch for red flags. Metaphorically speaking, one or two small red flags means you should stay aware of the surroundings. Big red flags mean don’t hang around to see what happens next. It’s a self preservation thing. If you want to be in the right place at the right time it’s a good idea to not book your time to tight. Then you can go for the opportunity when it’s available. Don’t stay home to work, go out and scout. Talk to anyone who’s interested. If they tell you about a great place go check it out. If you get a call that you should be there because someone requests your presence, go. Unless there’s red flags on it, then decide for yourself. It still amazes me that the farm I like at Cold Harbor, Via Farm, is the most peaceful and safe place in my stomping grounds because 150 years ago it was a crucial piece of land hotly contested by two armies. Cold Harbor was part of Richmond’s outer defenses. The Union army tried to break through so they could get to Richmond, the capital of the Confederacy, and destroy it. They fought there and then fought there again later but couldn’t get to Richmond that way. People kept saying, “this war can’t last long.” but it did. Over the course of a few years dead and wounded soldiers were strewn over the land for miles. Now, 150 years later it’s lush and green, peaceful and safe. The old weathered corn shed has so much personality it almost talks. It seems like nothing in life goes as planned, but then I see a twist of fate that brings me to a great view. That’s what I call being in the right place at the right time. The day I did this sketch the river was flooded. I wanted to paint the waterfall on the right but every time I went back the water was lower till it dried up over those rocks.